Hey all! April is just about dunzo! It's time to talk about what's been on my radar this month involving non-wardrobe things...though I totally broke that rule on one of my love affairs this month! Baseball is my favorite sport and April always means that it's the start of baseball season! I made it to Opening Day last year, but since I seem to make it only every other year I didn't make it this year. Bummerface! Oh well. Colorado has such back and forth weather in the spring (hot and cold, sometimes snowy and/or rainy, and almost always windy) that I'm trying to put off going to too many games (if any) until a little later in the season. In the past I've gone to one or two opening weekend, and then another a few weeks later, and if both had bad weather it just makes me reluctant for the rest of the season. We'll see how that goes, but regardless I'm super glad baseball season has commenced and that summer is officially on the horizon! Okay, so this is a fashion related love affair in a post about my non-fashion interests. 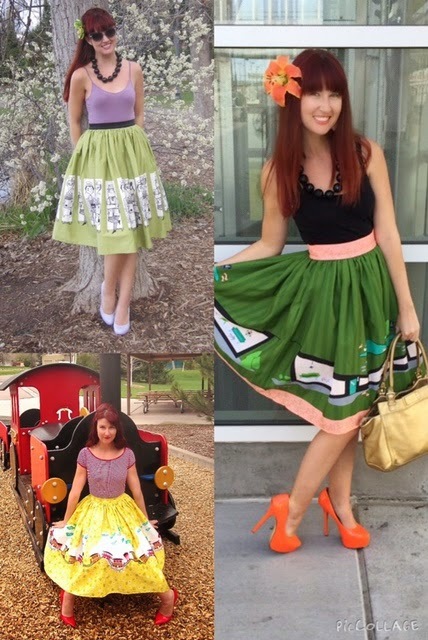 But seriously, with the releases of The Magic of Mary Blair collection at Pinup Girl Clothing AND The Oblong Box Shop releasing to the public their Palm Springs Swing Collection it's been a good month for us lovers of skirts and novelty prints! It just felt plain old remiss of me NOT to mention how awesome the novelty print game was in vintage reproduction land this month!! I don't know what it is, but my girl group just kind of has it together lately. 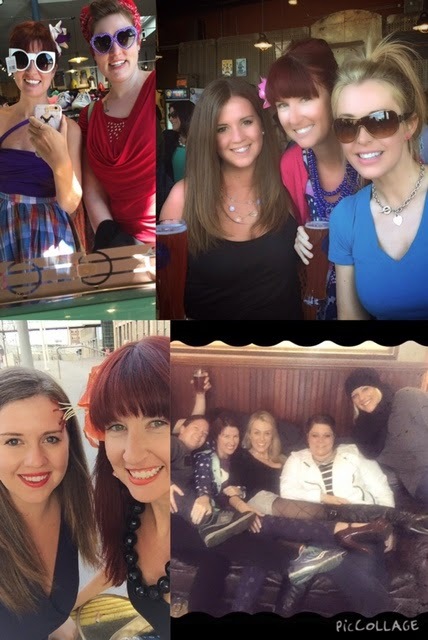 I have some girlfriends that I'm independently friends with that unfortunately I haven't seen this month, but amongst my friends who are mutually friends with one another it's been a very good month. We hang out at least once a week and sometimes someone brings one of their awesome friends, who are often girls after my own heart in that they're very funny ladies. Plus I've been connecting with a lot of new bloggers this month, so I'm just digging girl energy all around lately! Originally this slot was going to be about yoga! Earlier this month I felt huge tension all over my body and I attributed it to having not worked out in a while. I decided to start with yoga and was really glad I did because I think it's what I needed. I was all set to start practicing again every morning but then I twisted my ankle and injured the top arch of the foot. My ankle is healed, but extending and getting up off the ground is still tricky for me so yoga had to take a backseat. Luckily I was able to start going to the gym without injuring it further using weights and some incline on the treadmill (no running yet). My point with this love affair is that working out should always be about an inside out approach. If I get more toned up, then great. But my goal with working out is always to relieve stress, prevent body tension, and to just be healthy. I believe that this mentality is the best way to stick with any kind of workout regime because anything else causes too much pressure and guilt. Any goal in life should be about being healthy and not just aesthetics. I'm bummed I fell off the bandwagon for so long this winter and that I needed body aches to remind me to work out, but I'm glad I'm back at it and am feeling better because of it! I can't believe another month is down! I feel like this month work and my social life consumed my schedule, plus the gym, clothes, and peripheral stuff like the political storm that's starting to brew for 2016. Hopefully next month I'll have time to read more and get pumped up about a band or documentary I discovered-that's my only complaint about this past month: I had NO time for any of that :( Other than that, it's been a pretty great April and I'm looking forward to May! How about you? What were you all psyched about this past month??? I cannot wait to go to a baseball game this year! We have the Yankees farm team only 30 minutes away. It's a great summer activity and one I always look forward to! Oh fun! Wahoo for the sport of summer!! It looks like you're always having so much fun! Working out is definitely something I struggle with from the inside out. Focusing on being healthy is so great. It's good to hear you say that. So many messages make women feel that it's all about just losing weight. Your girlfriend get together's sound so fun! Right? I wish it was more health based, both emotionally and physically, as I think people would enjoy working out more indeed...and be healthier! My girlfriends are fun :) Thanks for stopping by!